Revelations: Visions, Prophecy, and Politics in the Book of Revelation offers a new look at the Book of Revelation from the perspective of Elaine Pagels, best known for her work with the Nag Hammadi Library—the collection of so-called “Gnostic Gospels.” The Gnostic Gospels are a series of codices (little books) found in Egypt in 1945, dated from the third and fourth centuries. These texts are called “Gnostic” partially for their hidden spiritual meaning, or gnosis, but also after the sect that gave birth to them, the Gnostics. Several earlier Christian leaders including Irenaeus and Tertullian attacked the Gnostic movement, branding it heretical because its adherents expressed views at odds with the acceptable doctrines of the Christian Church. If you do not own a translation of the Gnostic Gospels and have always been curious about them, Revelations is an easy way to gain some exposure. The book takes a polemical tone describing how religious authorities have used the Book of Revelation as a tool to thwart the Gnostic movement since it first emerged. Pagels, in fact, questions whether the book ever should have been included in the Bible at all and states that it was not the product of an Apostle. She posits that the defenders of early Christian orthodoxy invented the idea that John, the beloved disciple of Jesus and witness to the crucifixion and resurrection, wrote the Apocalypse. She holds that the real author was another John, a frustrated Jewish prophet/writer of no reputation who, shortly after the Roman war, was bent on lashing out at the Romans and Gentile converts of Paul of Tarsus. If you are a little rusty on your church history, Revelations will either confuse or delight, depending on your orientation to and appreciation for traditional Christian thought. The Church considers the Gnostic Gospels apocryphal (of doubtful authenticity) since they are pseudepigraphical (ascribed to authors who did not actually write them). Pagels asserts that defenders of orthodoxy had political reasons for stomping out the Gnostic cause, but fails to mention the real reasons why they did so. The early Church rejected Gnostic views not so much because the early Church Fathers were rigid about establishing orthodoxy (although they certainly were), but because the Gnostics did not believe in Jesus’ divinity or physical resurrection. Gnostic writings of the third and fourth centuries were frowned upon because they did not meet the minimum requirement of ­apostolic authority and authorship and also because they contradicted other works (biblical ones) that did. 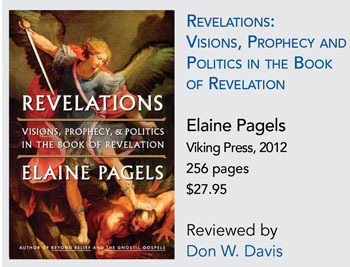 Bear in mind as you read Pagels’s book, when she says Revelation(s), she means the Gnostic ones and when she says Revelation (no s), she means the biblical one. In an effort to put Revelations on par with Revelation and to level the playing field for the Gnostics, she challenges the Revelation in two ways: 1) She calls into doubt the book’s apostolic authorship, and; 2) She criticizes its inclusion in the New Testament canon. Most scholars, including Pagels, believe that the Book of Revelation was written around 95 ad near the time of the Roman Emperor Domitian’s death. She tells a story of how her John turns up in Ephesus to distribute his book of propaganda after a brief exile on the Isle of Patmos. Once back on the mainland, John of Patmos goes to work sending his prophecy to the seven churches in Asia Minor, namely Ephesus, Smyrna, Thyatira, Laodicea, Pergamon, Sardis, and Philadelphia. This story is not unlike the traditional version featuring John the Apostle. He too was exiled to Patmos and at the death of Domitian returned to Ephesus, where the Christian Church had re-established itself after being driven from Jerusalem. The seven churches were all in a circular route from Ephesus, relatively near one another. Christians believe John the Apostle started these churches himself and was regarded with reverence and affection by their bishops. They believe this because the Book of Revelation was read in those churches immediately after it was circulated, and there exists testimony from some of the bishops of those churches as early as the beginning of the second century. It is difficult to imagine Pagels’s John of Patmos, furious with Rome and Gentile converts, gaining traction in the seven churches. Since they knew nothing of him and his prophecies, it is more likely he would have offended their congregations than delighted them. A sweep of all seven is hard to fathom. It is not so hard, on the other hand, to imagine the Apostle gaining immediate traction in those churches led by bishops he had put into place before his exile. At four different places, the Book of Revelation claims to be written by “John.” The author speaks with authority in chapters two and three to the bishops of the seven churches, starting with Ephesus. The author has thorough knowledge of what is going on in each of these churches as he comments on their strengths and weaknesses in minute detail. That this John was the famous Apostle comes from an early, reliable source—Irenaeus, who was a native of Asia Minor living near Smyrna where Polycarp, one of the three principal Apostolic Fathers, was bishop. Polycarp converted to Christianity by means of direct interaction with the apostles of Christ. He personally knew and communicated with many who had seen and heard Jesus. Polycarp knew John the Apostle, according to Irenaeus who called Polycarp a disciple of the Apostle. Irenaeus did not know the Apostle, but did know Polycarp. Irenaeus quotes from the Revelation again and again in his works as the product of the Apostle. I would inquire for the sayings of the Presbyters, what Andrew said, or what Peter said, or what Philip or what Thomas or James or what John or Matthew or any other of the Lord’s disciples, and for the things which other of the Lord’s disciples, and for the things which Aristion and the Presbyter John, the disciples of the Lord, were saying. The possible reference to a second John in this fragment is where the conspiracy theories of another John originate, theories that Pagels takes to a whole new level. The fact that there are two separate tombs in Ephesus bearing the name of John adds fuel to the fire, but a careful reading of the fragment is not definitive. Papias could have been referring to the same John in two different ways and, regardless of the rendering, he did not attribute authorship to either. No one made much of this until the fourth century when ­writers were looking for ways to soften the Christian message after the Romans legalized the religion under Constantine. Pagels contends that the earliest testimonies of apostolic authorship were manufactured. She accuses Irenaeus and Justin Martyr of making the whole thing up: “when critics charged that a heretic had written it, its earliest defenders sought to lend it legitimacy by insisting that Jesus’ own disciple John wrote its prophesies” (2). It is particularly distasteful that she would accuse the early Church Fathers of making up apostolic authorship when she herself offers no evidence whatsoever that any such John of Patmos ever lived. Pagels also tells us that the early Christians panned the book and few ever paid attention to it. She writes: “Ever since it was written, Christians have argued for and against it especially from the second century to the fourth, when it barely squeezed into the canon to become the final book of the New Testament” (2). Again, the facts seem to point in the opposite direction. There were very few, mostly anonymous, detractors of the book until 247 ad, when Dionysius of Alexandria built a case that the Apostle could not have written it. Dionysius noted what he believed were stylistic differences between the Book of Revelation and the Gospel of John and John’s Epistles. He felt it odd that John mentioned his own name in the Revelation, whereas he never did so in the other works of his hand. Scholars since have debated the stylistic differences, which do seem to exist, but the most obvious answer for this is that John wrote down the vision exactly as it unfolded on Patmos. Pagels believes, rather, that John of Patmos contrived the book for political reasons and that the style he used (“wartime literature” she calls it) was a method intended to put forward certain coded, political messages (7). Dionysius himself believed the work to be inspired, as Pagels notes, but not authored by the Apostle. Perhaps Dionysius did not give enough weight to the fact that the author was exiled to the Roman mines under guard and saw these visions in a cave, probably without much scribal help to record them. In Ephesus, where the Christian church hierarchy had transferred many resources from Jerusalem after the war, there was a cadre of Greek writers and scribes that could have worked with the text once it was in their care, but exiled on Patmos John was on his own with at most one scribe to assist him. Since he was told in the vision to write down exactly what he saw (Rev. 1:19, 22:18,19), he may have insisted that changes not be made to the raw text upon his return to Ephesus. Perhaps Dionysius should have excused the fact that John’s Greek was not smoothed out for that reason and acknowledged that he chose to drop the self-deprecating practice of omitting his name from his own work because this was not his own work, but rather Jesus’ own revelation. John likely identified himself because the emperor had banished him from the land of the living and was unsure as to whether he would survive. His job—as he probably saw it—was to get the vision out to the seven churches at all cost. In the case of his untimely demise, it would be more readily accepted if it bore the Apostle’s name. He calls himself John because he is the Apostle writing to his own flock. He does not need to identify himself further. Another source for Pagels is Eusebius, who in the fourth century picked up on the reference to two Johns of Papias to put forward a theory that Presbyter John may have actually penned the Book of Revelation, rather than the famous Apostle. Even Eusebius wavers and at times implies that the book is apostolic. It is ­conceivable that Eusebius, in his efforts to ­present the history of Christianity at the onset of the Imperial Church in the best light, was simply walking back the harshness of the Apocalypse in its apparent allusions to Rome. A reasonable conclusion to the objections raised in regard to the apostolic authorship of the Book of Revelation by the time of Dionysius and Eusebius must be that they are thin, late, and subjective. They were made long after the fact and far removed from the region where the author lived and the work was disseminated. The evidence for the Apostle having written it on the other hand, is strong, objective, and found in sources dated at or near the time of the writing, and in the region where it was written and distributed. Turning to Pagels’s second challenge, the canonization of the Book of Revelation, she states that it was left off of many lists of canonical books until the time of Constantine (161), which is not quite accurate. The book did not make it into the New Testament, as she would have us believe, by hook or by crook, but rather by the overwhelming consensus of the majority of councils, list makers, and influential writers, including those who knew the Apostle and accepted the Revelation as his work. The book was in the early canons from 170 to 400 ad including the Muratorian, Apostolic, Athanasian, and Augustinian canons, and was accepted by councils in 325, 393, 397, and 419 ad. The first council to reject it was the sixteenth council, the Laodicean Council, in the middle-fourth century. Laodicea was spoken of very negatively in the Revelation, as neither cold nor hot (Rev. 3:15), which may account for its exclusion by them. It was restored by the very next council. Don Davis received a BA from the University of Washington and studied Church History and Ancient Greek at Fuller Theological Seminary before receiving an MA in Religion from Liberty University and a PhD from International Seminary. He lives with his wife on Bainbridge Island, just outside Seattle, Washington.